Today we visit another of the locales featured on our Facebook Insights, which provides geographical data about where our page receives its “likes”, etc. New York remains our top city, but some interesting other towns made the list as well, including Piscataway, New Jersey. Piscataway is in Middlesex County in central New Jersey at the southern edge of the New York metropolitan area. The main highway running through the area is I-287, which connects to I-95 and the New Jersey Turnpike to the east, and then travels north and west into northern New Jersey and then back into New York. It is also served by Highway 18, one of the frequent limited-access highways that cover this part of the state. Unlike Saint Catherines, Ontario, which we profiled a couple of weeks ago, it is possible to draw a specific connection to Piscataway. Just south along Highway 18 is New Brunswick, which is home to the Alfa Art Gallery and the Omega Sound Fix festival from last November. If you have not read the original article from that event, I recommend following this link. The area supports an art and music scene via its proximity to Rutgers University. Like many towns in this part of the U.S., Piscataway has a long history, dating back to the late 1600s. It is listed as “one of the first five New Jersey settlements” (I am not sure what the significance of “first five” is). 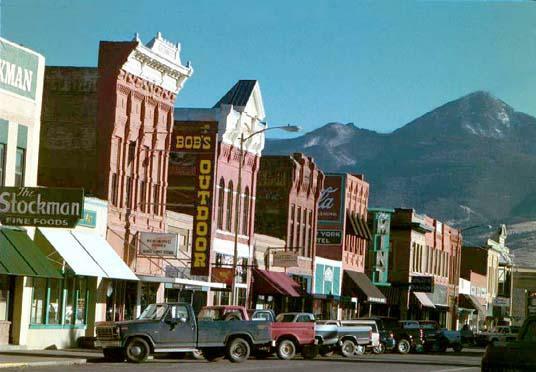 It has morphed from a more rural community to an established suburb that has been featured in real-estate sections in the New York Times, CNN and elsewhere. I also have read and personally experienced the area in Middlesex County as one of the highest concentrations of South-Asian Americans (aka “Indian Americans”) in the U.S. I have had relatives in and around the area for years (and I will further embarrassing them at this moment). 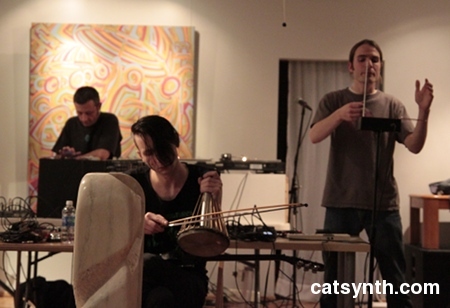 As with other events this year, I was live tweeting during the performance @catsynth, using the tag #omegasoundfix. Additionally, PAS has posted videos from the first night of the event, several of which are included below. Richard Lainhart live at Alfa Art Gallery (Part II) for the Omega Sound Fix Festival from PAS on Vimeo. I had not arrived in time to hear Lainhart’s introduction in which he explained that piece was by the renowned 20th Century composer Oliver Messaien – a 1937 piece Oraison that was was one of the early pieces written purely for electronic instruments. It was later adapted for acoustic instruments as part of Messaien’s “Quartet for the End of Time”, composed while he was in a German prisoner-of-war camp in 1941. Lainhart’s arrangement of the piece uses the Haken Continuum with a Buchla synthesizer. The music starts out very quiet and melancholy, like a mournful piece of acoustic chamber music. But one can hear the timbral details, suble pitch changes and effects that make it unmistakably electronic. Every so often, there is strong feedback in the sound, but it remains very expressive within the context of the piece. The harmonies move between minor and very anxious augmented. It feels very much like piece of music for a dramatic film, set in forlorn ruins or a desert approaching dusk. Lainhart then joined Philippe Petit for the next set. I would characterize Petit’s performance as “virtuosic experimental turntable”, as that was the primary instrument he was using (along with a laptop) to generate his sounds that were at once very natural and very constructed. The set began with Lainhart playing long bowed tones on the vibraphone set again Petit’s liquidy granular sounds, scratches, low rumbles and anxious harmonies. There was a strong contrast between the more ethereal and natural timbres, and the lower-frequency and louder machine noises. Petit’s sounds moved from more natural and machine towards snippets from other recordings with bits of distorted harmony, and urban city-like environments. It then changes over to turntable effects, pops and skips and speed changes, and gets noiser and more agressive. Lainhart’s bowed vibraphone provides a constant dreamlike quality against Petit’s changing textures. Philippe Petit collaborates with Richard Lainhart live at Alfa Art Gallery for the Omega Sound Fix Festival from PAS on Vimeo. At some point during the set, the duo were joined by a guitarist to form a trio. [Note if anyone can provide me the guitarist’s name, please let me know!] The trio with guitar began scratch and percussive, but became more tonal over time. There is a section which I referred to as the “thud march”, which electrical pops forming a march-like rhythm with other turntable effects filling in the space in between. The rhythm breaks apart after while, with the electronic pops continuing in a more chaotic pattern, and scratching and percussive effects on the guitar providing a counterpoint. 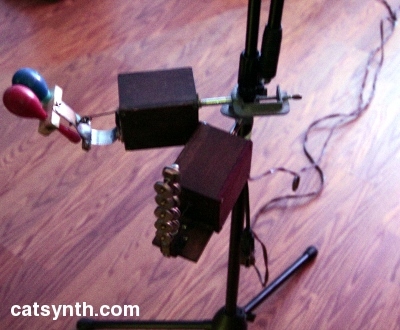 Quiet inharmonic synthesizer pads can be heard in the background. The set drew to a large close, starting with a quiet turntable solo and then into a big finish, with loud howling wind-like sounds, and dark harmonies. They were followed by PAS (Post Abortion Stress). Petit remained on stage and joined regular group members Michael Durek, Robert L Pepper and John “Vomit” Worthley and guest saxophonist Dave Tamura. The set began with a very simple pentatonic sequence. On top of this, Worthley played a bowed waterphone waterphone, and Durek soon joined on thermin with a melodic line. Tamura’s saxophone provided a strong counterpoint to the other elements, alternating between very expressive jazz-like lines and a “skronking”. There were moments where the saxophone and thermin seemed to respond to each other, melodically and harmonically. At some point, the original pentatonic pattern cut out, and the music centered around saxophone, theremin and electronic violin. This was followed by a purely electronic section with dark analog sounds and driving electronic drums. Pepper repeatedly slammed his electronic violin against the table, while Tamura played fast runs on the saxophone. Another interesting moment was Pepper using a standard fishing rod as an instrument (perhaps the first time I have seen that), set against synthesizers, guitar and saxophone. Gradually the music gets louder and more insistent, with driving percussive guitar, loud saxophone, and synthesizer sweeps, howls and sound effects in the background. Below is a video of PAS’ entire performance. PAS live at Alfa Art Gallery with Dave Tamura & Philippe Petit from PAS on Vimeo. The Sunday program began with blithe (doll). 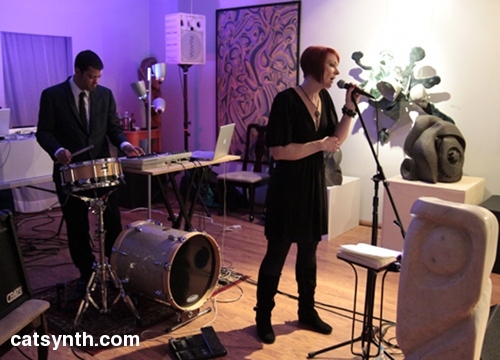 The performance combined acoustic drums as a foundation with live electronics and voice. I particularly liked the combination of loungy Latin rhythm and harmony in one piece with eerie electronic sounds and Phrygian vocal melodies that permeated much of the set. There were sections that were more “spacelike” with analog square waves and loud hits. Overall, the slow rhythms and melodies were reminiscent of goth or darker electronic club music. This was a fun set to watch and listen too, and the band drew a relatively large crowd. I guess that should be surprising given that the band is local, and husband-and-wife duo of James and Lisa Woodley were well known from the previous band. Blithe (doll) was followed by Borne (aka Scott Vizioli). He created a large dramatic and very visual soundscapes. Although his sounds included ambient, environmental and noise-based material, there was also a somewhat unsettling minor harmony that seemed to be just under the surface. Nonetheless the overall sound it was quite meditative, and easy to get lost in the soundspace. Over time, a beat emerged, very sparse and minimalist with metallic sounds. It gradually became stronger and more drum-like, with ethereal bell sounds in the background. I also recalled a single sample of a dishwasher (or something that sounded like a dishwasher) towards the end. Next up was Octant, which could be described as a band consisting of one human and several robots. The electromechanical robots play acoustic instruments (drums, etc.) while the human member of the band, Matthew Steinke performs on lead vocals. Octant was followed by Ezekiel Honig. As stated in the program notes, “He concentrates on his idiosyncratic brand of emotively warm electronic-acoustic music.” The set began with sounds that evoked water as well as machinery. I was able to hear that we was making extensive use of looping, although as he states he is “using the loop as more of a tool than a rule” and elements come and go freely outside the context of strict looping. A strong heartbeat sound emerged, and then later other elements joined to form a calm rolling pattern. At one point a strong major 7th harmony emerged. The beating changed sublty over time, as did the implied harmonies, which became more minor. Towards the end, the sounds seemed to focus on voices in the distance and other evidence of everyday human activity. I had to begin setting up for my set after this, but I was able to part of Trinitron, the musical project of local artist Mark Weinberg. More so than Honig’s set, Trinitron’s performance was very focused on looping of processed electric guitar. Weinberg sat with his guitar in the middle of a circle of candles, and began to layer different lines and effects on top of one another. The resulting sounds from were alternately harmonic and gritty or noisy. Overall, his performance had an ambient dream-like quality to it. Amar Chaudhary at Omega Sound Fix (Part 1) from CatSynth on Vimeo. Amar Chaudhary at Omega Sound Fix (Part 2) from CatSynth on Vimeo. My performance was the last of the evening, and of the festival. Overall, I thought it was a great experience, both as a performer and audience-member. Thanks to Michael Durek and Mark Weinberg for organizing this event, and to the Alfa Art Gallery for hosting. On Sunday, November 21, I will be performing a solo set at the Omega Sound Fix festival at the Alfa Art Gallery in New Jersey. Click on the digital dinosaur picture above to see the flyer featuring the full festival line-up. I am excited to be a part of this event. To help us fully fund the festival and make it a success, we have launched a Kickstarter campaign. Check out this video from festival organizers Mike Durek and Mark Weinberg, and donate something if you can. We have discounted tickets, CDs, DVDs, and other neat things to offer as rewards (I wouldn’t mind the housecleaning myself).